Everyone dreams of having more money than they currently have in their bank account. Some just continue to work at their job, hoping for a promotion, and others try to increase their income through gambling. Winning small prizes is fine, but hitting a large jackpot is a dream come true for many individuals. Whether they play bingo, the lottery, gamble online, or go to a casino, all jackpots have different payout rules and strategies. If you go to a local hall and play Bingo you can typically win smaller prizes. However, if you play online, the stakes can get quite high and there are a variety of different types of games that can be played. Progressive games are calculated by taking a percentage of each ticket, or board, sold and add it to the prize pot. That means the more players that are in an online bingo room, the higher the overall jackpots go. While the odds of winning are less, the size of the jackpot can increase dramatically. These rooms offer a set jackpot regardless of the number of people who play. If there are only a few players, the odds are much more in your favor. If there are many players, the odds are less, but the prize is still the same. These types of games are interesting in the way that the longer the game continues, the size of the jackpot decreases. They start out high at first, but will gradually drop as the game continues to play. They are designed to add a level of excitement to a game of chance. Escalators are the opposite of sliding jackpots. As the game continues the size of the prize increases. They start out low and gradually increase as the game moves on. 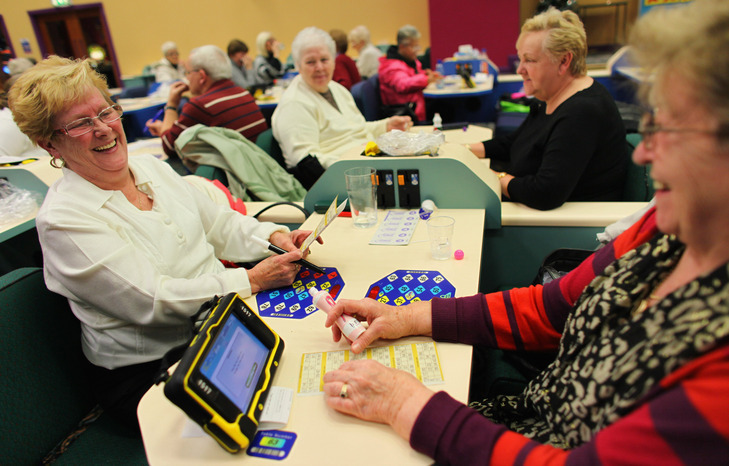 Each moment is a tense one in these bingo rooms, as players must hope they get to the jackpot before other players, but not before the jackpot grows enough. Developing a strategy to these games of chance can be fun and challenging at the same time. To win at these games there are some steps you can take to increase your odds of winning. Be sure to enter a gaming room before the time caps out. Take advantage of any deals that are offered with early enrollment. If possible, play in quieter jackpot games to increase your odds of winning. There are hundreds of thousands of lottery games. Between scratch tickets, daily number drawings, weekly drawings those are just a few. Bigger games, such as Powerball, is a multi-state game that offers extremely large jackpots for those lucky enough to win. The contests are progressive, with the prize increasing each drawing that goes by without a winner. Most recently, a Powerball winner from Massachusetts won a $700 million prize. While your chances of getting struck by lightning are statistically higher than winning the Powerball game, people flock to the store to buy tickets as the prize increases. Even with a 1 in 292 million chance of winning, luck and $2 can win you the jackpot. To have a better-than-even chance of winning, a player would have had to buy 300 Powerball tickets a week for the last 13,500 years. That’s about the time of the end of the last Ice Age. Since this is just not realistic, here is what you can do to increase your chances of winning the big lotto games. Pick the number that has been among the “winning numbers” most often. While there are a few numbers that have shown up roughly 10% of the time, they still have better odds than the rest of the number options. While you can still win big with any number combination, as the lottery saying goes, you can’t win if you don’t play. Some of the hottest and biggest jackpots are found in online gaming rooms. In some states, online gaming has been outlawed, but in other locales across the United States and Internationally, gambling on the world-wide-web is a huge industry. The first step is finding a reputable website. You will never win big if you play on a spammer site and will probably lose big, should they access your bank account. Finding a legitimate site is critical in online gambling. Some prefer slots while others prefer poker tables. Each has their pros and cons. Slots have multiple features, such as pay lines, autoplay, and max bet that can help you increase your odds of winning by betting the maximum combination of lines played, with the maximum amount played per bet. Whether standard or progressive jackpots, slots can offer you the opportunity to win big. Table games on the other hand, are a game of chance as well as strategy. Each combination of cards offers different statistical chances to win. If you understand the statistics behind the cards, mixed with a little luck and bidding strategy, you stand the chance of winning some very large jackpots. Games like the World Series of Poker (WSOP), which is a Texas Hold’em poker game, typically get their players initially through online gaming. Contestants join a game with an initial entrance fee and play until there is no one left at the table. If they are playing in a big tournament, such as the WSOP, players continue to conquer tables until there is no one else to play against. This year the WSOP top prize was set at over $8 million. Many players have entered the realm of being considered professional poker players, as that is their only form of income. Amateur players are those that play poker, but also have another job. Those who play at poker tables in casinos are most often amateur players, as they do not play often. If you understand the game, you have a good chance at winning against amateurs playing at casino tables. No matter how you gamble, you take a risk of losing. However, you also may be the lucky one who wins it all and scores the largest jackpot on record. All it takes is entering one bingo game, purchasing one lottery ticket, or joining a poker table to become a contender for the top prize. Be the first to comment on "Everything You Need to Know About Jackpots"